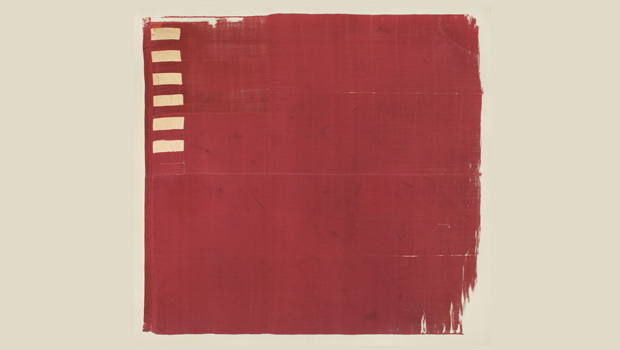 NEW YORK -- A New York City auctioneer is offering for sale a rare Revolutionary War flag it says could bring between $1 million and $3 million. Doyle New York says the 1775 Forster Flag is the earliest surviving flag representing the 13 original colonies. The relic is named after Samuel Forster. He led the minutemen of the Manchester Militia Company in Massachusetts when they responded to British march on Lexington on April 19, 1775. It's being sold Wednesday to benefit the Dolph Briscoe Center for American History at the University of Texas at Austin. It had been part of the Flag Heritage Foundation's collection until the Dolph Briscoe Center purchased the collection in 2013. The proceeds from the flag sale will endow the collection. Doyle says the Forster Flag is one of only 35 examples known to survive.